So, the cast over at All Comics Considered did a segment on Episode 31, on which superheroes can be considered “Working Class Heroes.” I listened to my friends talk about Hawkeye(s), Spiderman, Thing, Wolverine, even Punisher – yes, all of these heroes could be considered “working class,” but something was missing. Because of the culture that I’m in, that particular term brings to notion the image of white guys with big wrenches fixing cars or welding stuff together. Maybe working on crews bringing up crude oil from the earth or something. What the phrase doesn’t immediately bring up is the idea of “working class” superheroes that are also People of Color. It took me a minute to realize that of course it can and, should mean that too. 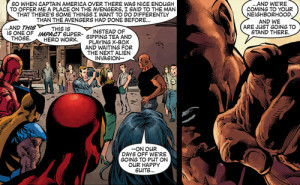 The strongest case in point for this is none other than the bulletproof, former crown wearing badass known as Luke Cage. To me, Luke Cage represents my everyman: he’s the one who can and has made mistakes, but has done better. Who isn’t perfect, but who always gets up and tries again. In recent times Luke Cage has “moved on up” and lead a team of Avengers, but his success doesn’t represent a move away from his roots. Luke always remembers where he comes from; it’s at the heart of who he is. When Luke lead his own team of Avengers, he did something that no one else did: He put money back into his community. Luke proves the axiom, “A Rising Tide Lifts All Ships.” He also passed out Avengers membership cards to people who agreed to help out others. He created an opportunity for everyone around him to be heroic. He never ever forgets who he is and he never leaves his people behind. And if that’s not a working class hero, I really don’t know what is.